Wondering how things are going at Formlabs? Let’s just say that high-resolution 3D printing is making its way to your desktop. 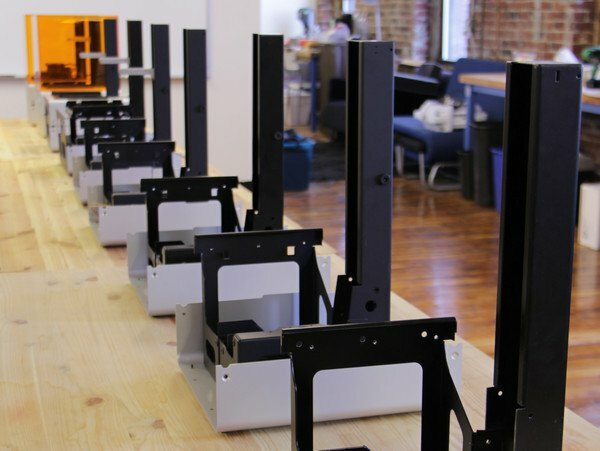 We’re excited to report that our engineers are hard at work building ten beta Form 1 printers (see below). This batch of machines crowned in orange come fully packed with design changes from alpha prototype testing over the past several months, taking us much closer to launching our production lines as promised. In the coming weeks we will use the “Betas” to test and optimize everything from user experience to component durability to print accuracy. We’re grateful to the people who have already helped in testing our Alphas, and we look forward to giving even more freedom to our beta testers. Speaking of user input, the response from our recent survey has been amazing. More than 60% of future Form 1 owners responded, giving us great suggestions to both improve the printing experience and to better support you in the process. We look forward to working with you and learning more in the coming months. We’ll be sure to announce the lucky winner of a bottle of resin soon. At Formlabs, we’re designers, engineers, and makers just like you. We all want freedom to design. Freedom to innovate. Freedom to create. That’s why we’re moving full steam ahead. It’s about time all of us were Free to Form.